Independence, Mo., Postal History 1831-1860s, collection of 40 covers mounted on pages and loose, some early letters with interesting content including 1840 blue cds use with content on the presidential election then pitting William Henry Harrison against the incumbent Martin Van Buren referred to as the "Little Dutch Cheat"; 1846 concerning 100 barrels liquor to Sante Fe, 1850 green cds and "Paid X" rating, red cds on #10A embossed lady's cover to Washington D.C., #9 irregular block of three at prepaid 3¢ rate to Smyth Co. Va., etc., also includes Preston Roberts Jr. 25¢ "Mail Contractor" stage fare bank note illustrated with stage coach, F.-V.F. Independence was laid out in 1827 to serve as the county seat of Jackson County, created by Missouri state legislature the previous year. The Post Office was also established in 1827. For about 20 years, Independence reigned as the Gateway to the West. By 1830, it had replaced Franklin as the eastern terminus of the Sante Fe trail. Liberty Mo. 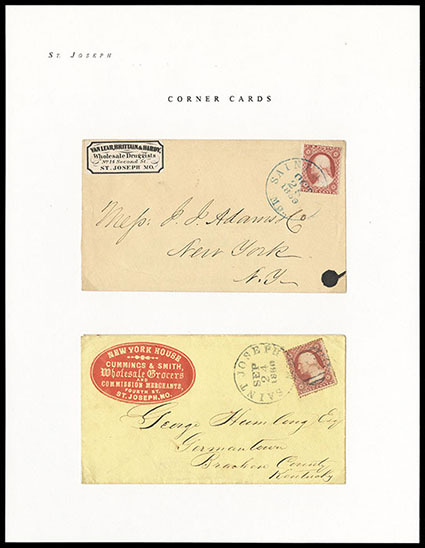 Postal History, 1824-1864, group of 18 covers including one of only two recorded "Clay C.H." ms. Clay Court House usages in private hands; 1831 "Liberty Mo" ms. postmark letter; 1834 and 1837 "Liberty Mo." fancy oval handstamp letters (bold strike with vertical tear); second cds-style struck in red, black and greenish, red Liberty cds use with "Overcharge 6¼" re-rating, two Henry Coleman free franks, #24 strip of three use, and a Clay Seminary corner card oval handstamp on a 10¢ use to Cal., etc. ; some faults, F.-V.F. Missouri Territorial and State Balance, group of 12 covers comprising 1821 St. Louis black territorial cds, 1821 St. Louis red cds with "T" removed, 1824 St. Louis, 1842 St. Louis, 1848 "Arrow Rock", 1830 "Boonville", 1846 Boonville blue cds with "5" and "10" ratings, 1849 Independence green cds, 1827 "City of Jefferson" ms. postmark, 1829 "Jef. Cit. Mo." cds, 1823 "St. Genevieve, Missouri" statehood oval; some faults, F.-V.F. Saint Joseph Mo. 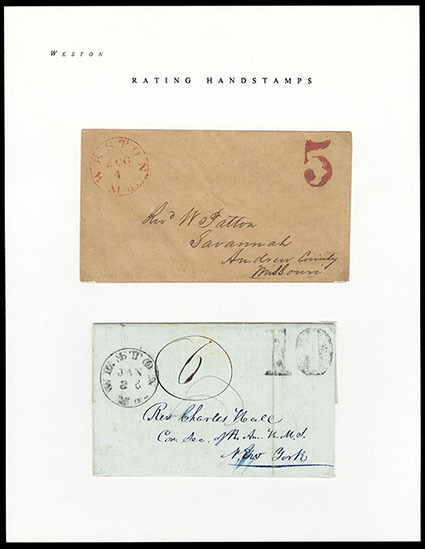 Postal History, 1844-1860s, collection of 62 covers including 1844 "St. Joseph Mo." manuscript. 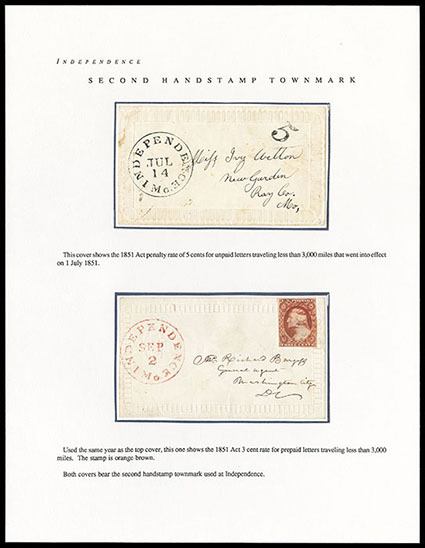 postmark letter, blue "Drop 1ct" in circle use, #7 on printed J. & G.W. Cargill circular, corner card advertising including. New York House cameos in blue and red and three different Saint Joseph Female College, Nebraska Territory map ad, a few Civil War patriotics; some faults, F.-V.F. 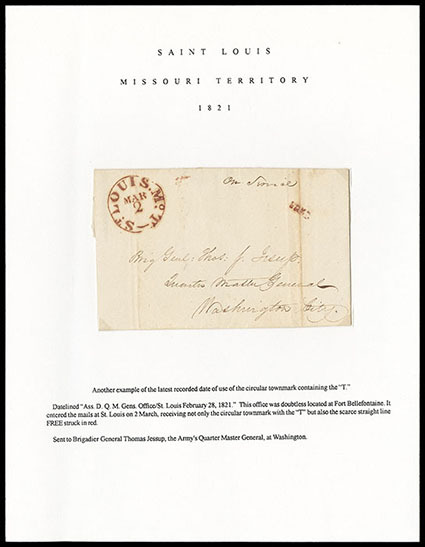 St. Louis Mo., Territorial Period, 1805-1821, collection of 25 territorial covers, plus one inbound use, two letters 1805 and 1806, and some additional related material like a newspaper, illustrations and Mo. bank note, better includes 1814 "St. Louis" ms. postmark letter use mentioning Rufus Eaton being elected territorial delegate to Congress and Indian attacks in the area as part of the War of 1812, 1815 "St. Louis" ms. postmark and "37½" cent war surcharge rating letter use datelined "Franklin Ville Farm", 1815 "ST LOUIS, DEC. 18" two-line postmark and "37½" cent war surcharge letter use from Edward Bates to his brother Frederick mentioning a local St. Louis dispute over where to build the new public buildings in the city, 1816 "ST LOUIS, MAY 17" two-line postmark on "R Easton" free franked letter as Congressional delegate, plus 8 additional "ST LOUIS" two-line postmark usages of varying types, 1819 "St. Louis. Mo. T, Oct 30" black cds eku use struck in black, and 1821 "St. Louis. Mo. T, Mar 2" red cds LKU use (two used same day in collection), etc., F.-V.F. St. Louis Mo., Statehood Period, 1821-1860s, group of 45 covers plus a few illustrations, 1824 "St. Louis Mo. 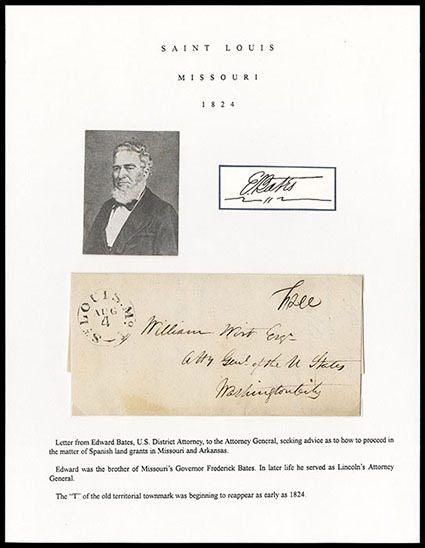 T, Aug 4" cds reintroduced on letter from Edward Bates U.S. District Attorney to the Attorney General asking for advice on matter of Spanish land grants in Missouri and Ark., 1827 "S Louis Mo." ms. postmark letter; 1829 letter from Sen. Thomas Hart Benton, 1831 "S Louis Mo" ms. postmark on military letter to Jefferson Barracks; St. Louis Mo. ms. "40" rate to San Francisco, some advertising covers including all-over Henry Pike & Co. whiskey w/#25, 1860s use of #U34 entire with "Saint Louis Mo. Dead" cds, two #24 uses with "1" framed carrier handstamp, and red "2" in circle drop rating cover, etc. ; some mixed condition, F.-V.F. (Unorganized Missouri Territory) Fort Leavenworth, 1832-1860s, collection of over 25 covers mostly mounted on homemade pages, noted includes 1832 "Cant. 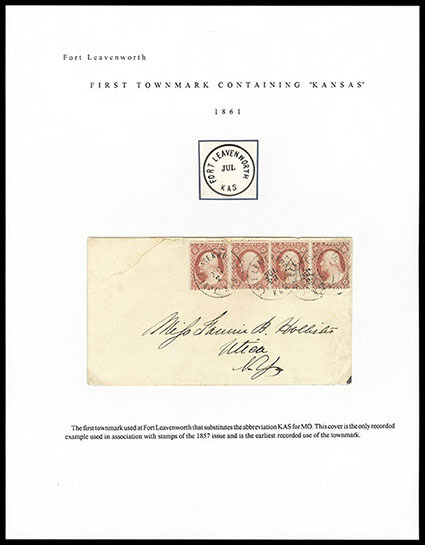 Leavenworth" ms. postmarked letter, 1837 "Fort Leavenworth" datelined letter signed "S.W. Kearny" to Capt. E.A. 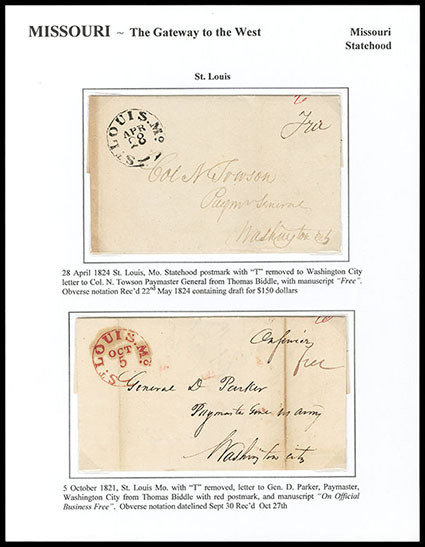 Hitchcock at Jefferson Barracks via military courier noting arrival of Steamboat Pirate and enclosing a $600 check; "Fort Leavenworth, July 5/57" ms. postmark on 3¢ Nesbitt entire to Hamilton Va. (one of only 3 recorded late ms. townmarks without state designation), a few Civil War patriotic uses, free frank of Senator Samuel C. Pomeroy on blue Congressional ad cover, and two incoming usages; some mixed condition, F.-V.F. Weston Mo. 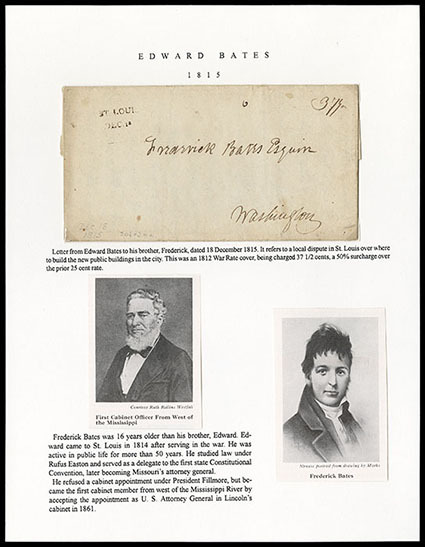 Postal History, album of over 25 covers, some content letters plus related maps and illustrations, includes manuscript "Weston Mo." use, the first cds's (incl. 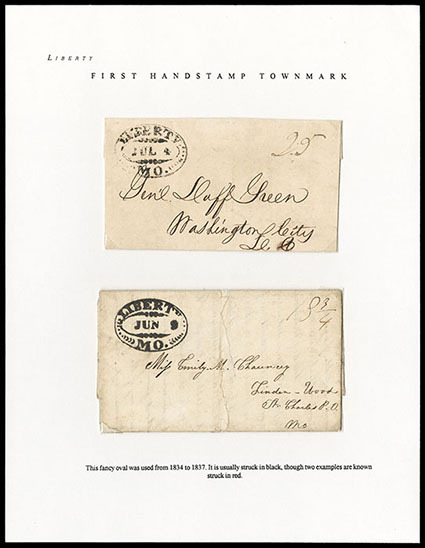 EKU strike), large "5" and "10" rating handstamps, #11 uses, 1860 transatlantic use to Wurttemburg at 30¢ PCM rate, etc. ; some faults, F.-V.F.